Western Paper is an award-winning provider of distribution services and products for the washroom, janitorial, food service and lodging industries. 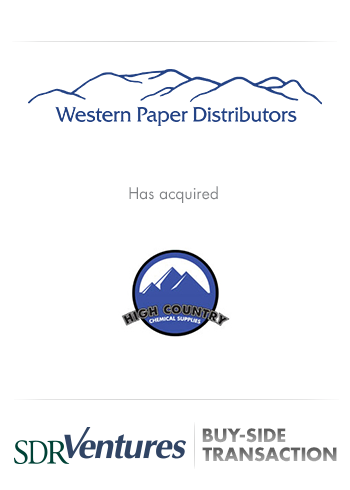 Since 2010, SDR has been helping to identify strategic acquisitions that will continue Western Paper’s successful role as one of the largest independent distributors in the industry. SDR principals work closely with Western Paper’s management team to ensure that our goals are in line with the company owner’s goals of growth and expansion. By outsourcing the identification, negotiation and finalization of these acquisitions, Western Paper is free to focus on the strong organic growth and day-to-day management of a large and growing enterprise. This six-year relationship has led to two successful buy-side transactions that have helped increase Western Paper’s distribution services and customer base across a broad region of the western United States.